Polishing Diamonds is when the polisher fixes the cut diamond into a metallic holder called a dop. The dop is cleverly designed to hold the diamond with much of one side of it exposed. Then he inverts the holder so that the stone is beneath and a stout copper wire attached to the holder is then clamped firmly in a movable vise. The gemstone is then placed on the bench in such a position that it rests upon the surface of a lap--a rapidly revolving horizontal iron wheel. The latter surface of the diamond is charged with diamond dust, dust that have been pushed into the metal surface which acts as a support to the dust. The diamond is worn away by the latter, producing a flat facet. The polisher keeps the lap moistened with oil and freshens it with oil and diamond dust is applied from time to time. A rotation of 2,000 speed per minute is used. Diamonds are cut and polished for preparations of sales. Cutting and polishing these rough stones is a specialized skill that you will find in a limited number of locations in the world. Polishing diamonds overall, consists of two distinct operations -- the polishing property and the setting. The setter uses a furnace filled with burning charcoal. 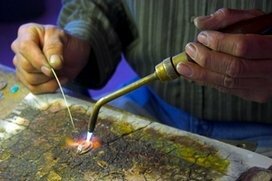 He solders the diamond into a quantity of alloy resting in a brass or copper cut, attached to a rod for holding it by. Tin and lead are the mixtures of alloy, which, when pressed into the cup, gives the form of an acorn, with the diamond as its apex. The soldering is not easy to do, there are sixty-four distinct surfaces to be smoothed in the brilliant and each surface must be properly adjusted in the burning mould. The setter uses his fingers to adjust the setting of the metal around the diamond. And unless, his fingers are fireproof, the setter can adjust this metal without burning his hands. After its manipulation, the alloy is plunged into water to be cooled, the cloud of steam that arises certifies the painful temperature in which the hand of the worker has been subjected. The diamond is then given to the polisher, set as the apex of the acorn-shaped lump of metal, which rests in a brazen cup with unyielding stem. The polishing rooms are next for the diamonds to go to be polished. The work itself can be difficult, especially with African diamonds. This work carries on from generation to generation of patience and monotonous toil, the technical skill inherited and acquired by the finished workmen is certainly rewarded by a glittering surface from the hardest stone. Months even years sometimes are required for the perfecting of single stones. It is said that African Diamonds are particulary hard and difficult to polish; however, in the end this hopelessly resistant gem yields to man's tirelessness. Diamonds are polished in a polishing wheel of steel scattered over a table with three of the copper cups filled with alloy. Then, the implement near the centre of the table, with two upright pieces or feet at the end of it, is for holding the diamond on the wheel for the polishing diamonds operation. There is a vice on the end in which the tail or stem of the copper cup is tightly screwed. A tripod is formed as the cup carries the diamond forming the third foot. Seen at the head of the implement are the nut of the screw and the key for turning it. One will understand its use from the cut showing the polisher at work. After the diamond is polished, it is determined how well light passes through it, which is very importance to its brilliance. It is very important to select a diamond that is laboratory certified as good, very good or excellent polish. Diamonds that are very poor to extremely poor polished are less brilliant, because of the microscopic polish lines that are still on them and blurs the surface of the diamond. The polish line reduces the amount of light that enters through or exits from the diamond. Be aware of selecting a diamond, fore, some are poorly polished. The cutters save on labor costs by not taking time to polishing diamonds after cutting them.